Just take a look at some of the hot movers in the under-$10 complex from Thursday, including Bonso Electronics (BNSO, which is skyrocketing higher by 48%; XG Technology (XGTI, which is soaring higher by 19%; Allied Healthcare Products (AHPI, which is ripping higher by 16%; and Dynasil Corporation of America (DYSL, which is spiking higher by 10%. You don't even have to catch the entire move in lower-priced stocks such as these to make outsized returns when trading. One low-priced stock that recently spiked sharply higher after I featured it was biopharmaceutical player Alimera Sciences (ALIM - Get Report), which I highlighted in Jan. 10's "5 Stocks Poised for Breakouts" at around $4.80 per share. I mentioned in that piece that shares of Alimera Sciences had recently entered into a consolidation chart pattern and the stock was starting to spike higher off its recent lows. That spike was quickly pushing shares of ALIM within range of triggering a big breakout trade above some key near-term overhead resistance levels at $4.83 to $5.14 a share. Guess what happened? Shares of Alimera Sciences didn't wait long to trigger that breakout, since the stock exploded higher the following trading session with strong upside volume. This stock then went on to uptrend for the next four trading sessions with bullish upside volume flows. Shares of ALIM tagged an intraday high on January 17 at $8.44 a share, which represents a monster gain of over 70% in just six trading sessions for anyone who bought this stock in anticipation of the breakout. You can see here how under-$10 stocks can make powerful moves in very short timeframes when key resistance levels get taken out with volume. One under-$10 biotechnology player that's starting to trend within range of triggering a major breakout trade is Oncolytics Biotech (ONCY, which is focused on the discovery and development of pharmaceutical products for the treatment of cancers. This stock has been destroyed by the sellers over the last three months, with shares off sharply by 37%. If you take a look at the chart for Oncolytics Biotech, you'll notice that this stock is ripping higher today with strong volume as ONCY crosses back above its 50-day moving average of $1.80 a share. This spike has also pushed shares of ONCY into breakout territory, since the stock has started to challenge some key near-term overhead resistance at $1.85 a share. This move is quickly pushing shares of ONCY within range of triggering an even bigger breakout trade. Traders should now look for long-biased trades in ONCY if it manages to break out above some near-term overhead resistance levels at $1.91 to $2 a share with high volume. Look for a sustained move or close above those levels with volume that hits near or above its three-month average volume of 600,358 shares. 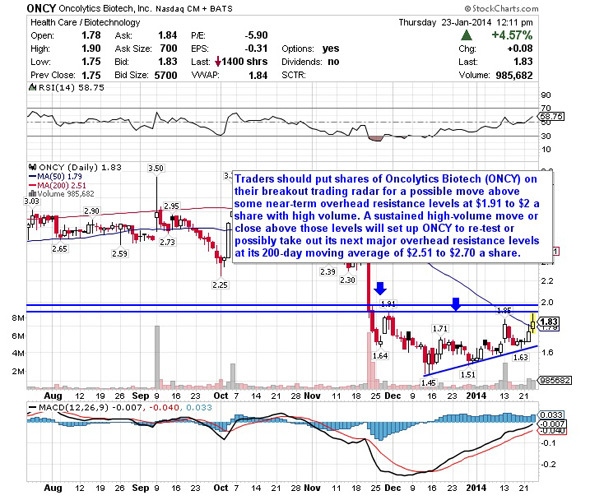 If that breakout triggers soon, then ONCY will set up to re-test or possibly take out its next major overhead resistance levels at its 200-day moving average of $2.51 to $2.70 a share. Traders can look to buy ONCY off any weakness to anticipate that breakout and simply use a stop that sits right below some key near-term support at $1.63 or $1.60 a share. One can also buy ONCY off strength once it starts to take out those breakout levels with volume and then simply use a stop that sits a comfortable percentage from your entry point. An under-$10 technology player that's starting to move within range of triggering a major breakout trade is RiT Technologies (RITT, which provides intelligent infrastructure management and indoor optical wireless technology solutions. This stock has been hammered by the bears over the last three months, with shares down sharply by 30%. If you take a look at the chart for RiT Technologies, you'll notice that this stock has formed a major bottoming chart pattern over the last two months, with shares finding buying interest each time it has pulled back to near or just below $1.60 a share. Shares of RITT have now started to spike higher today back above its 50-day moving average of $1.80 a share with strong volume. 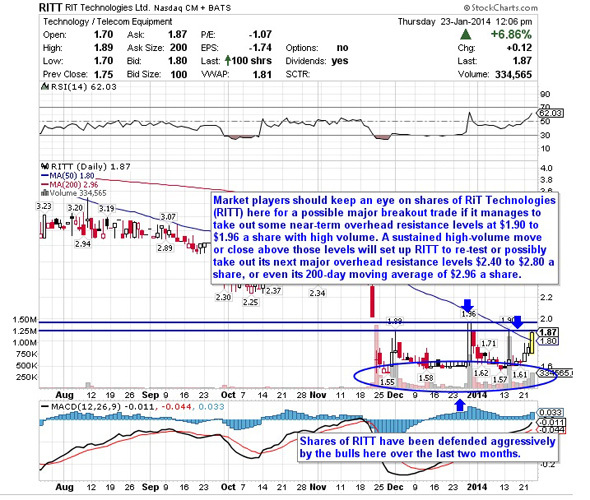 That move is quickly pushing shares of RITT within range of triggering a major breakout trade. Market players should now look for long-biased trades in RITT if it manages to break out above some near-term overhead resistance levels at $1.90 to $1.96 a share with high volume. Look for a sustained move or close above those levels with volume that hits near or above its three-month average action of 136,787 shares. If that breakout hits soon, then RITT will set up to re-test or possibly take out its next major overhead resistance levels $2.40 to $2.80 a share, or even its 200-day moving average of $2.96 a share. Traders can look to buy RITT off any weakness to anticipate that breakout and simply use a stop that sits right around some key near-term support levels at $1.60 to $1.55 a share. One can also buy RITT off strength once it starts to clear those breakout levels with volume and then simply use a stop that sits a comfortable percentage from your entry point. 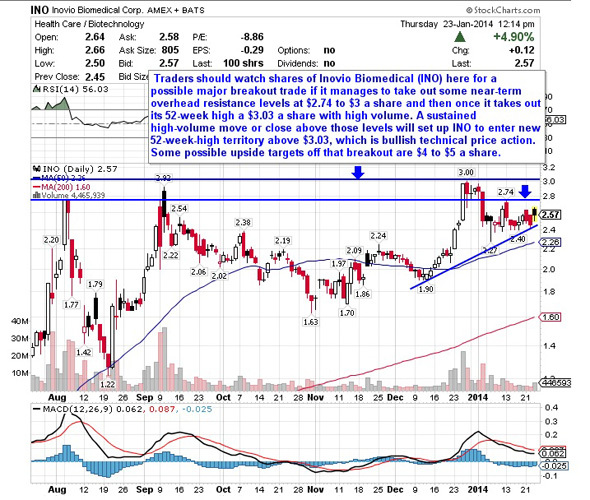 Another under-$10 biotechnology player that's starting to trend within range of triggering a big breakout trade is Inovio Pharmaceuticals (INO - Get Report), which engages in the discovery and development of synthetic vaccines and immune therapies focusing on cancers and infectious diseases. This stock has been a popular name among the bulls over the last three months, with shares rising notably by 21%. If you take a look at the chart for Inovio Pharmaceuticals, you'll notice that this stock is spiking higher here right above its 50-day moving average of $2.26 a share with strong upside volume flows. Volume so far today has hit over 4.2 million shares, which is just starting to surpass its three-month average action of 4.18 million shares. This spike is starting to push shares of INO within range of triggering a big breakout trade above some key near-term overhead resistance levels. Traders should now look for long-biased trades in INO if it manages to break out above some near-term overhead resistance levels at $2.74 to $3 a share and then once it takes out its 52-week high a $3.03 a share with high volume. Look for a sustained move or close above those levels with volume that hits near or above its three-month average volume of 4.18 million shares. If that breakout triggers soon, then INO will set up to enter new 52-week-high territory above $3.03, which is bullish technical price action. Some possible upside targets off that breakout are $4 to $5 a share. Traders can look to buy INO off weakness to anticipate that breakout and simply use a stop that sits just below its 50-day moving average at $2.26 a share or around $2 a share. One can also buy INO off strength once it starts to take out those breakout levels with volume and then simply use a stop that sits a comfortable percentage from your entry point. Another under-$10 biotechnology player that looks poised for higher prices is Codexis (CDXS - Get Report), which engages in the production of custom industrial enzymes for use in the pharmaceutical, biofuel and chemical production. This stock is off to a hot start in 2014, with shares up sharply by 22%. If you take a look at the chart for Codexis, you'll notice that this stock broke out recently, a trade I flagged in this piece, above some key near-term overhead resistance levels at $1.53 to $1.57 a share with monster upside volume. That breakout spiked the stock sharply higher to its recent high of $2 a share. Shares of CDXS have now pulled back off those highs to around $1.70 a share. Market players should now look for a continuation move higher in the short-term if CDXS can manage to take out some key near-term overhead resistance levels. Market players should now look for long-biased trades in CDXS if it manages to break out above some near-term overhead resistance levels at its 200-day moving average of $1.93 a share to its recent high of $2 a share with high volume. Look for a sustained move or close above those levels with volume that hits near or above its three-month average action of 185,745 shares. 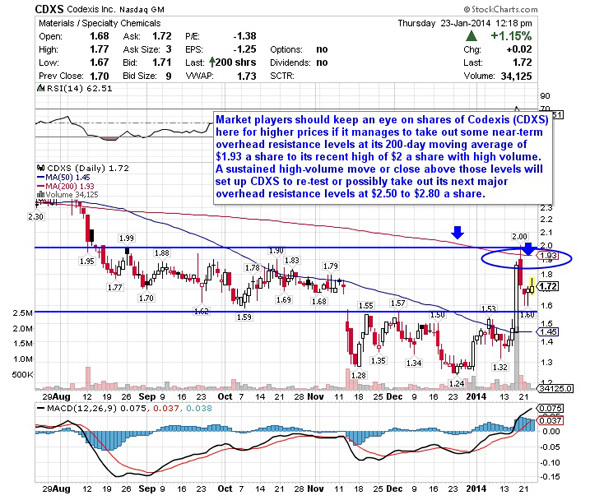 If that breakout hits soon, then CDXS will set up to re-test or possibly take out its next major overhead resistance levels at $2.50 to $2.80 a share. Traders can look to buy CDXS off weakness to anticipate that breakout and simply use a stop that sits just below some key near-term support at $1.60 a share or just below its 50-day moving average of $1.45 a share. One can also buy CDXS off strength once it starts to clear $1.93 to $2 a share with volume and then simply use a stop that sits a comfortable percentage from your entry point. One final under-$10 telecommunications player that's quickly moving within range of triggering a major breakout trade is Alaska Communications Systems Group (ALSK - Get Report), which provides integrated communications services to business and consumer customers in Alaska and internationally. This stock is off to a decent start in 2014, with shares up notably by 13.5%. 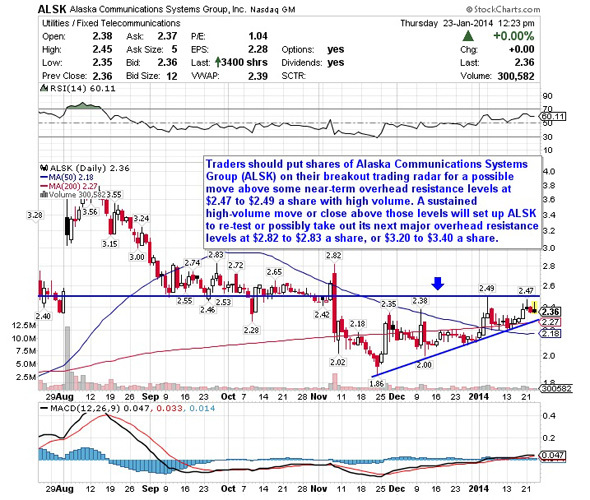 If you take a look at the chart for Alaska Communications Systems Group, you'll notice that this stock has been uptrending strong over the last two months, with shares moving higher from its low of $1.86 to its recent high of $2.49 a share. During that uptrend, shares of ALSK have been consistently making higher lows and higher highs, which is bullish technical price action. That move has now pushed shares of ALSK back above both its 50-day and 200-day moving averages, which is bullish. That trend has also pushed shares of ALSK within range of triggering a major breakout trade. Traders should now look for long-biased trades in ALSK if it manages to break out above some near-term overhead resistance levels at $2.47 to $2.49 a share with high volume. Look for a sustained move or close above those levels with volume that hits near or above its three-month average action of 491,092 shares. If that breakout hits soon, then ALSK will set up to re-test or possibly take out its next major overhead resistance levels at $2.82 to $2.83 a share, or $3.20 to $3.40 a share. Traders can look to buy ALSK off weakness to anticipate that breakout and simply use a stop that sits right below its 50-day moving average of $2.18 a share or around $2.10 a share. One can also buy ALSK off strength once it starts to take out those breakout levels with volume and then simply use a stop that sits a comfortable percentage from your entry point.